"The St. Francis Inn is a meeting destination where personalized service, in a relaxed, refined setting, is our highest mission. We pride ourselves on a genuine caring staff and comfortable historic accommodations which guests return to time and again. We pledge to fulfill the unexpressed wishes of our guests while maintaining our professional and friendly style." Impeccable service, comfortable historic accommodations, and amenities that executive travelers expect - that's why St. Francis Inn is the ideal choice for your small retreat or meeting. We're a small, quaint inn where your gathering will be the only group event taking place. We can help you personally design every facet of your meeting, including professional site inspections and custom-designed adventures. We watch your budget, with the added value of complimentary full buffet breakfast, a social hour (5:00-6:00pm) with wine, beer and hors d'oeuvres, and complimentary onsite parking. Your attendees will discover Old World charm permeating our rooms and suites, many with private balconies and porches, fireplaces, and whirlpools. St. Augustine's semi-tropical climate allows us to extend meeting and breakout spaces to tranquil courtyards with lush gardens throughout much of the year. We provide refreshment breaks and are able to cater lunch breakouts. We will customize a menu to your individual taste and budget; we have no set menu package plans. 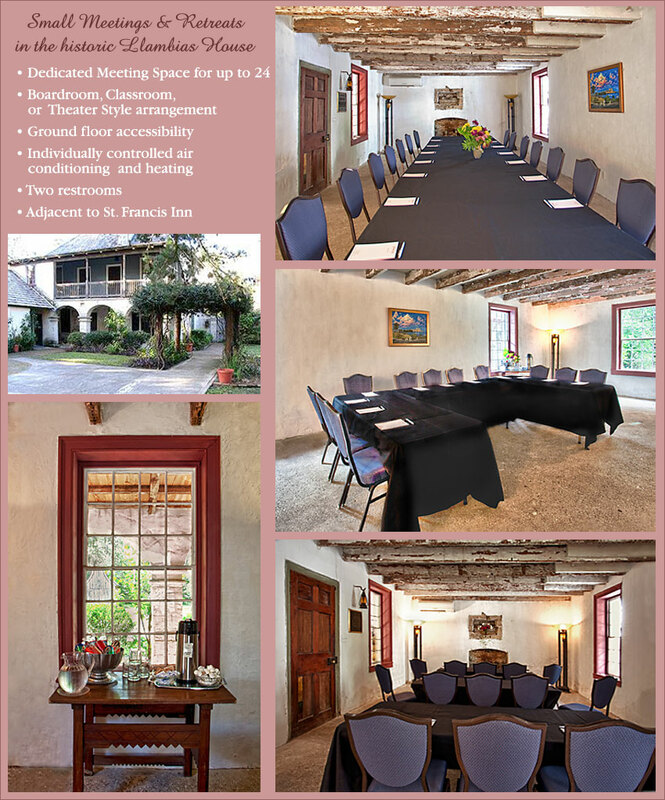 Meeting space is conveniently located adjacent to the main Inn, in the historic Llambias House, one of St. Augustine's (and America's) oldest original buildings, circa 1763. It's a national historic landmark, with a comfortable meeting space adaptable to many configurations, plus nearly a square block of enclosed garden for a private reception. And it's just steps away from the Inn, directly across St. Francis Street. The “main attraction” of our Inn is St. Augustine itself, and we are in the heart of its charm, culture, festivities, and international flair... yours to explore! The oldest city is teeming with superb restaurants, just blocks away from the Inn, presenting a variety of cuisines - French, Italian, New Orleans, Spanish, German, British, Cuban and Southern - as well as exceptional fresh seafood. There are a multitude of tours which are ideal for small groups: sunset schooner cruises, tasting tours, evening ghost walks, historic building tours, a monthly art walk, trolley tours, and many others. The area has special events, festivals, demonstrations, celebrations, festivals, and activities year 'round. We'll be happy to help you plan activities during the non-meeting hours of your stay. 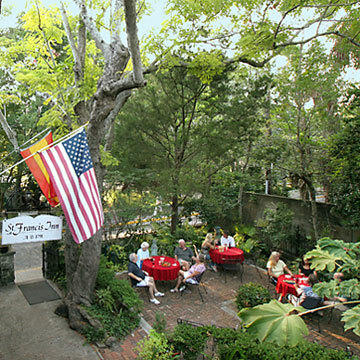 ** St. Francis Inn guests receive complimentary admission to the St. Augustine Lighthouse & Museum. Our guests also receive discounts on purchases in the gift shop. "Thank you everyone for the wonderful support you gave us during the meeting. I got great reviews on the location and the facilities and I appreciate how you improved the weather."